← In the Marketing Meeting, Did Anybody Say This Book’s Title Out Loud, First? I’ve started pondering this question, on and off, due to the influence of two thought-provoking women I know: Dr. Janna Levin, and my wife, Zakiya. Dr. Levin, right, is an astrophysicist at Columbia University and author of the astounding 2002 book, How the Universe Got Its Spots: Diary of a Finite Time in a Finite Space. In her volume, Dr. Levin, who, since reading Spots, I’ve had as a guest on my radio show and the pleasure of making an acquaintance, describes a fall 2000 conversation between physicist Lee Smolin and artist Marc Quinn, at the Institute for Contemporary Arts in London. 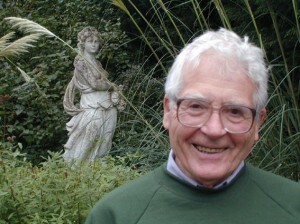 I’d heard of this so-called Gaia Hypothesis before, originally proposed in the 1960s by British scientist James Lovelock, right, and had never thought much of it. But for some reason, reading Smolin’s statement that night, it kind of exploded in my head. Like, on a certain level, it made perfect sense. How could you disprove it? Do we even have the ability to tell if something is alive on that immense scale? Well, one Saturday night in February 2003, I was passionately babbling about astrophysics to Zakiya, the way men tend to do about anything in which we’re very interested. My wife knows nothing about physics, but she’s absolutely the most intuitive person I’ve ever met, often eerily and uncannily so. That night, I was showing her a computer simulation of the universe’s large-scale structure, from the “The Once and Future Cosmos” special edition of Scientific American. 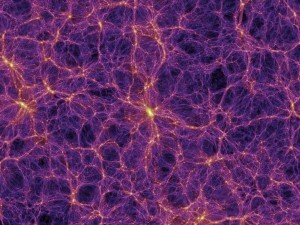 The visual was essentially identical to the one at the top of this post: Our universe, when viewed at a scale of about one-and-a-quarter billion light years across. This image, above right, is an approximately 4X zoom in on the center region of that topmost picture. 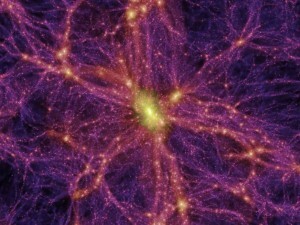 What you’re seeing spans over 300 million light years, edge to edge. In other words, if you were traveling at the speed of light, 186,282 miles a second, it would take you over 300 million years to get from one side of this expanse to the other. Such distances typically turn the mind to dust. But at that moment, what had most captivated me was the image’s fibrous texture and red-shifted color. I mentioned the Gaia hypothesis to Z, wondering if this notion could be applied, not just to our Earth, but to the cosmos as a whole. I was captivated by the arrangements in this rendering. “It looks like muscle tissue, or something,” I said. Zakiya stared at it a moment longer. Then, in response, she made a statement, in a matter-of-fact voice, that completely blew me away, one that I will never forget. Though sitting upright in bed at the time, somehow I stopped dead in my tracks. Whoa. In other words, as though every dynamic process in the universe—galaxy formation, supernovae, expansion, black holes—is merely the effect of it thinking? When I met him in 2007, I wish I’d told Dr. Roger Penrose, Emeritus Rouse Ball Professor of Mathematics at Oxford University, and author of the modestly titled The Road to Reality: A Complete Guide to the Laws of the Universe, right, about this conversation with my wife. 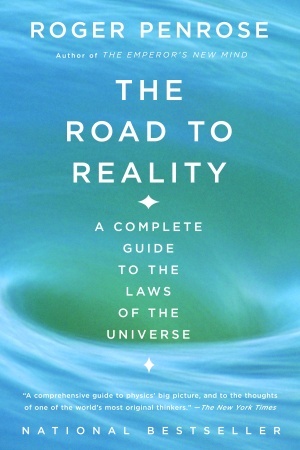 The Road to Reality is a cleanly written, massive guidebook of over 1,100 pages, 4 lbs of mass, and a fair amount of math designed to take readers through the universe from particle to the horizon; the tiniest tacks to the roof, so to speak. But this book of physics actually represented a kind of departure for the scientist. Penrose has actually made questions about the nature of sentience and consciousness his chief area of inquiry, for example, in books such as The Emperor’s New Mind: Concerning Computers, Minds, and the Laws of Physics and Shadows of the Mind: A Search for the Missing Science of Consciousness. In our conversation, Penrose admitted that the issue of what consciousness is—he didn’t have a definition for it—was something that we’d only truly get at with a better understanding of quantum physics, and some new, yet-to-be-discovered math. It was almost like he was into the math just so that he could ultimately explain his mind to himself. To put it mildly, it was a wild convo. (Almost as wild as when Z stretched the domain of Gaia to the observable universe!) I really had to hold on sometimes, but it was amazing to ponder his ideas, and to broaden my own. Roger Penrose is the guest today on my WBAI-NY / 99.5 FM radio show, NONFICTION, this afternoon, Friday, June 12, at 2 pm ET. This paired with your post makes the mind go: waaaaaaaaaaaaaa? You should definitely check out the work of Alan Watts, specifically “The Book On The Taboo Against Knowing Who You Are”, he hits on many of these issues, regarding the one-ness of the Universe and how this relates to us as people and our consciousness. wow, im amazed by how similar youre thoughts are to mine. i just read about a flashing star called mira in the guardian. and i suddenly thought, what if stars, galaxies etc are really higher dimensional beings moving through our dimensions. What if we are like the creatures at the bottom of a huge ocean of space looking up at these stately creatures moving around up there ? like whales. and what if they are conscious? these big conscious creatures moving through space. For better or for worse, i do believe that the Universe is conscious, and that this is God, or at least some aspect of god. Thus, I think everything that happens, happens to god. A sci-fi program has been made on this idea. Watch The Outer Limits – Its in the Blood – Series 7.